Take an international guest to a game of Australian football and there are some key attributes that will grab their attention. One is the immense size of the ‘pitch’ or ‘field’, or that there appears to be no rules. Opposition fans sitting together can raise an eyebrow, as do the goal umpires! Though no longer in overcoat and wide brimmed hat, they’re quirky all the same. Then there is the run-through banners. 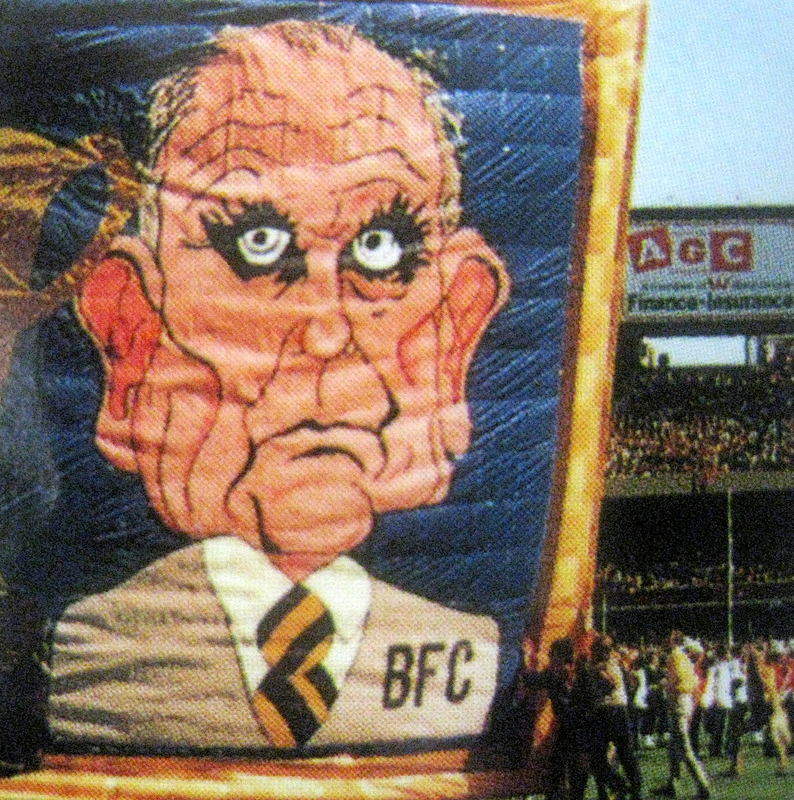 The creation, proud raising and then systematic destruction of large run-through banners made of crepe paper is truly a unique facet of the Australian football experience. 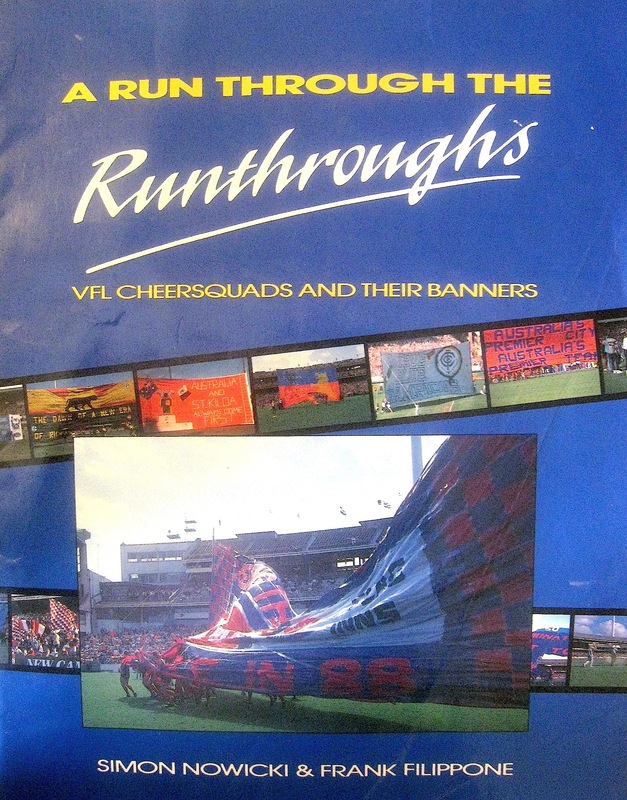 This brings me to the purpose of this post…to review the book ‘A Run through of Runthroughs, VFL Cheersquads and their Banners.’ I was prompted to review this book after scoreboardpressure.com’s Vin Maskell reminded me of it, having been inspired by a short fictional video on the inner workings of a league club cheersquad. I got my hands on this book in 1991 for my eleventh birthday. I know this because it is scrawled inside the front cover. I was truly mesmerised with the book; I guess as a Richmond supporter it was important to form a well-rounded appreciation of the winter game. So flags, floggers and banners certainly caught my eye in my formative footballing years. ‘A run through of runthroughs’ is broken down into sections, which sees all type of banner on display. 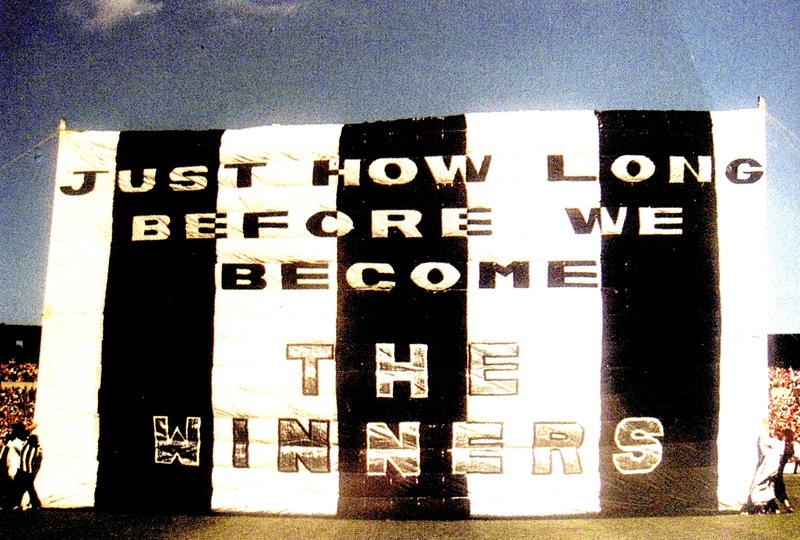 From banners recognising players milestones or club sponsors to banners focussed on opposition weakness, political and social comment, the book moves much like a football season, culminating with a section of finals banners, followed with the big one, Grand Finals. But first to where it all began…back to the days of black and white photography. 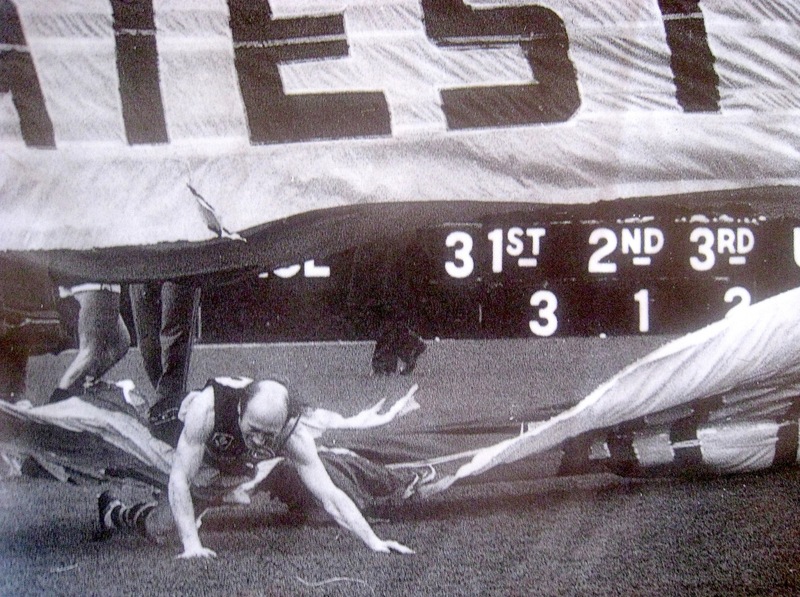 With streamers covering the players race as the Red Legs take the field in the 1957 Grand Final, Ronald Barrassi is the player ducking the streamers, perhaps the first player to superstitiously avoid the runthrough banner? As a banner must be created before match day, and the book takes us behind the scenes to some banner making sessions. Cheersquads used the bellies of grandstands, town halls, sporting halls… anywhere where they could find the space to accommodate the sheer banner size, displayed somewhat in the below photographs. Let’s kick things off with some funny ones. The Brisbane Bears, (a most misleading title as they weren’t based in Brisbane and their mascot, a koala, is not a bear!) were not like Melbourne league clubs. They had a private owner, played at a makeshift stadium….and it was too warm up there for footy! 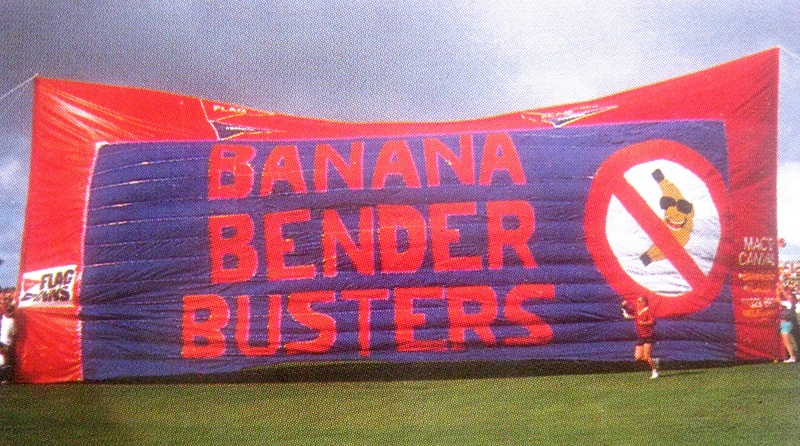 As such, to protect the games culture, the Melbourne cheersquad came up with this banner. 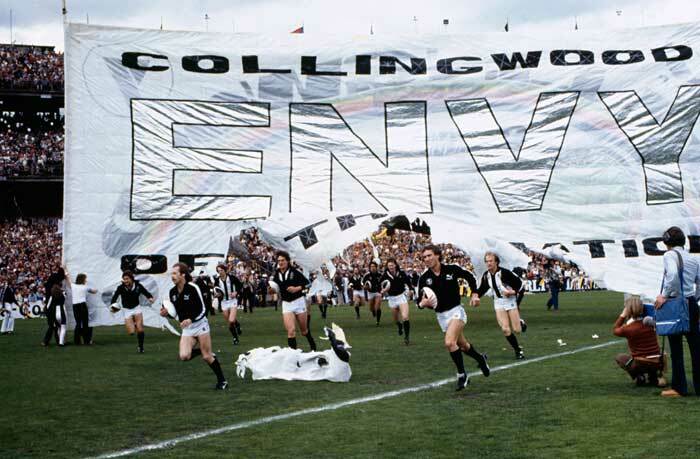 When it comes to Collingwood you either love them or the opposite. However, you must appreciate their ability to have a laugh at their own expense. 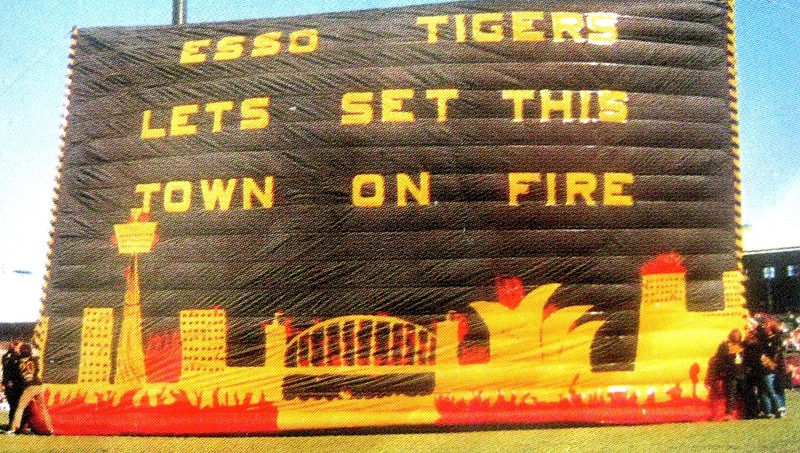 This banner came a short time before they broke their 1958 premiership drought. The 1980’s saw one team in particular dominate. 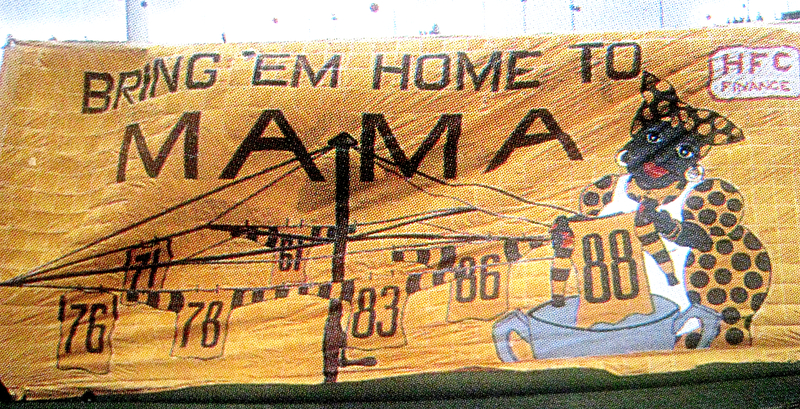 Hawthorn played in seven consecutive grand finals from 1983-1989, winning four flags along the way. 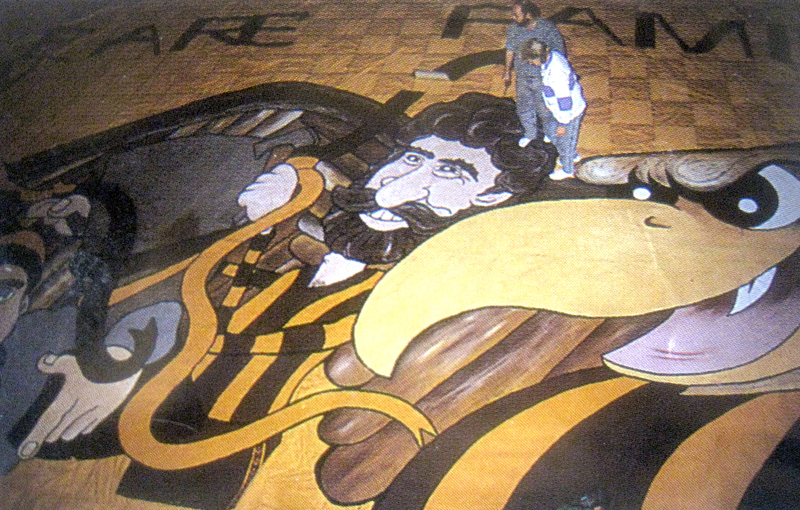 They followed this with another flag in 1991. They expected success. 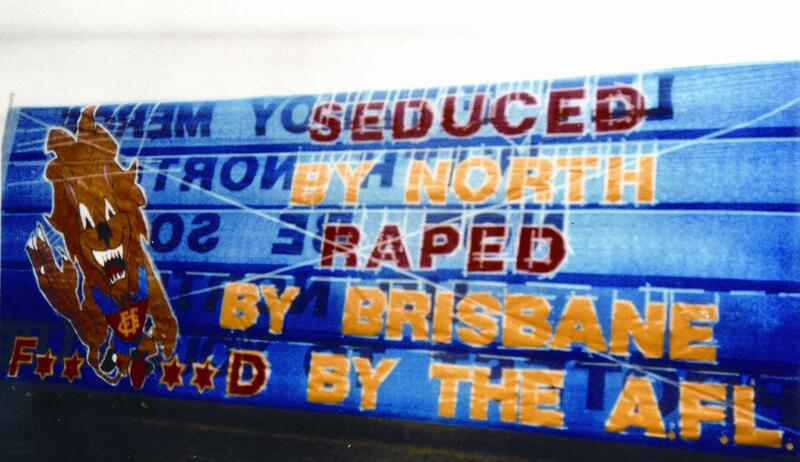 Their grand final cheersquad’s banners give evidence of that. 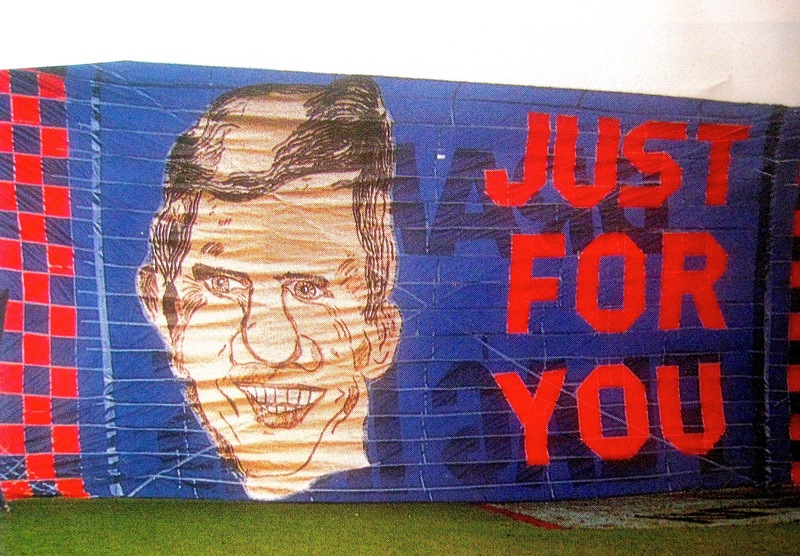 The following banners are cocky yet clever….and very artistically put together. “For what we are about to receive may the Lord make us truly thankful” 1985 Grand final, a loss. 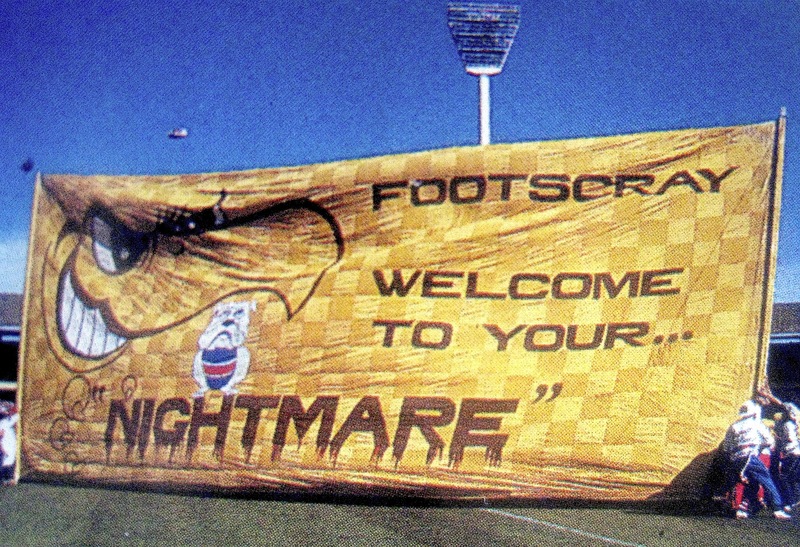 Cheersquads have long used their banners to send political or social messages, however this had been heavily curtailed after a certain banner that appeared and displeased the AFL in 1996. On the occasion below, people power ruled the day, and according to the book, VFL headquarters lines were jammed for hours! 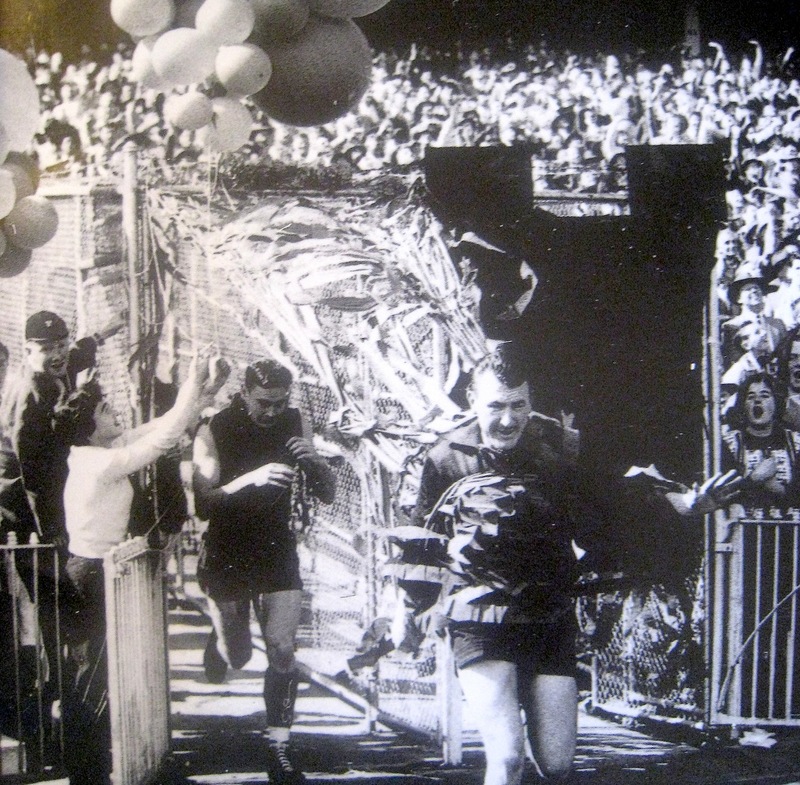 Around the same time as ground rationalisation, the national competitions rugged beginnings also pulled at the heartstrings of supporters. 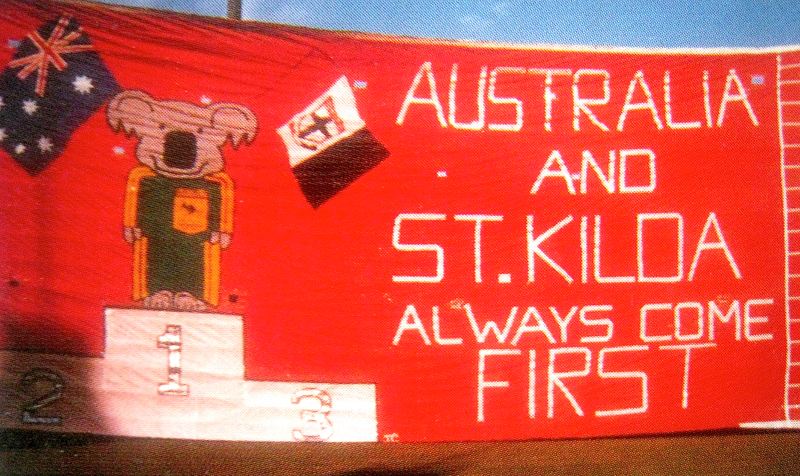 St.Kilda, who were one of many teams rumoured to be relocating or even folding, had this message for the then VFL. Economics forced the Collingwood cheersquad to think outside the box, asking fans to fill out a coupon in the Herald-Sun and send it in to the club. The overwhelming response saw a ‘double-banner’, seen below. 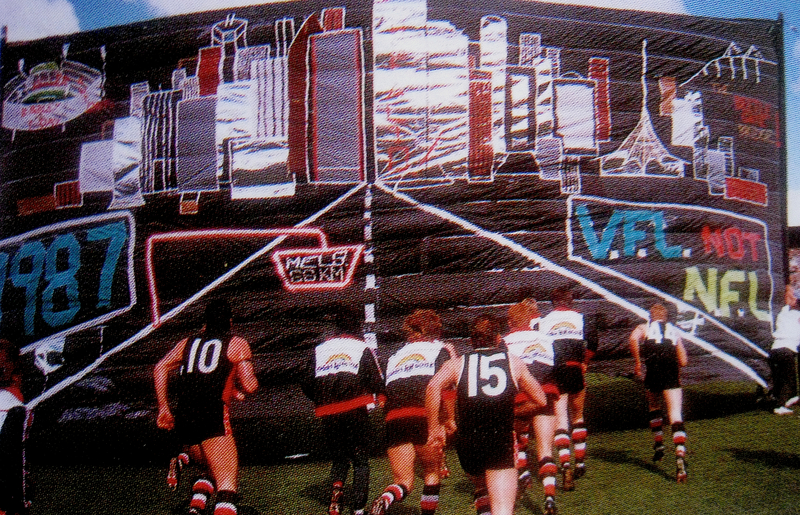 Melbourne journeyed to Footscray for the final home and away round of 1987. It is still a round remembered for going right down to the wire in relation to finals spots, and had Melbourne lost, it would have been club legend Robert Flower’s final game. As it turned out, the Dees got up, yet the cheersquad should be commended for it’s forward planning. What they should not be commended for however is the appalling bald spot they bestowed upon their club legend. Whilst not blessed with lustrous locks, he certainly didn’t take to the field with a bizarre looking combover. Another cheersquad to have had a ‘seniors’ moment was that of St.Kilda. 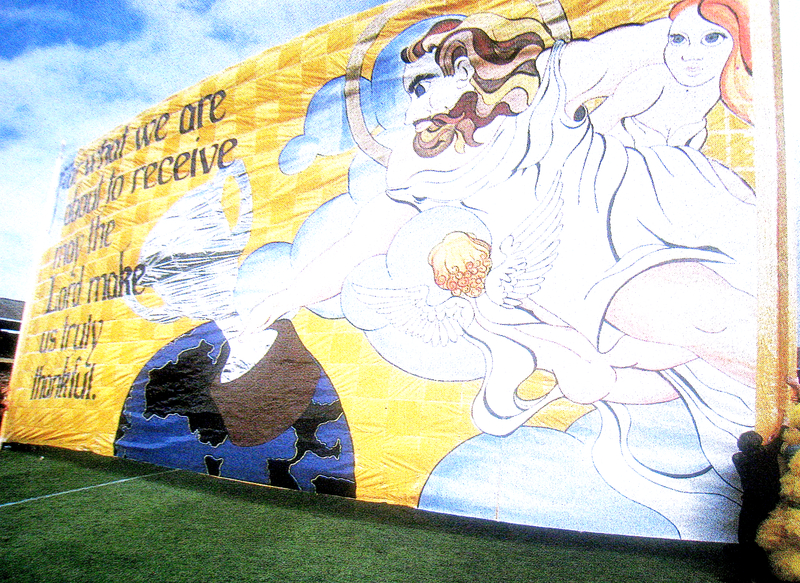 Obviously taken with the Olympic games of 1984, this banner gives us a rather inflated view of the footballing world as we know it. With so many more banners to show you than can fit in this post, I will now show you a few more of my favourites. The first one is obvious. It’s my club. But there’s a distinct Melbourne verses Sydney theme happening here also. The photograph below strikes me on a number of levels. 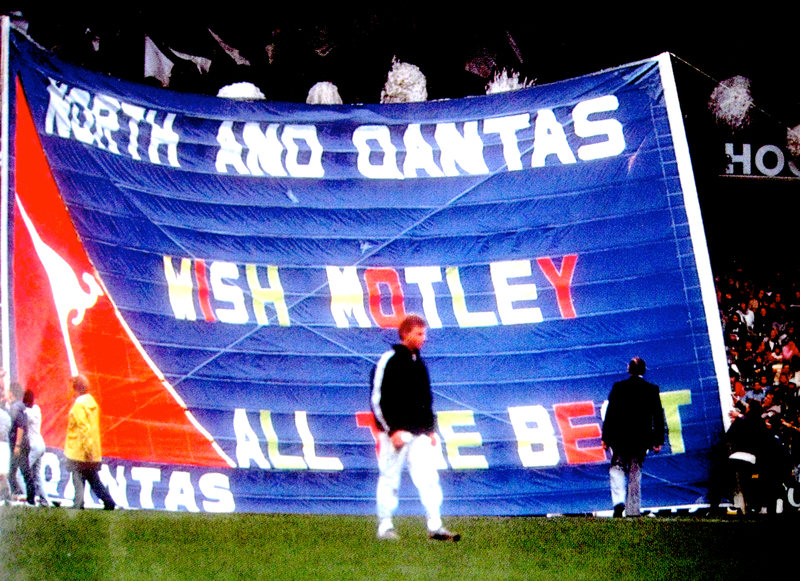 Firstly, as Pete Motley was a Carlton player tragically injured in a car accident which ended his playing career, to see an opposition club devote one side of their banner is touching. Secondly, in the background we see the rest of the North cheersquad sitting and the darkened second tier of the old souther stand. I loved it up there. Finally I will leave you with this… two bald blokes who both coached Richmond. 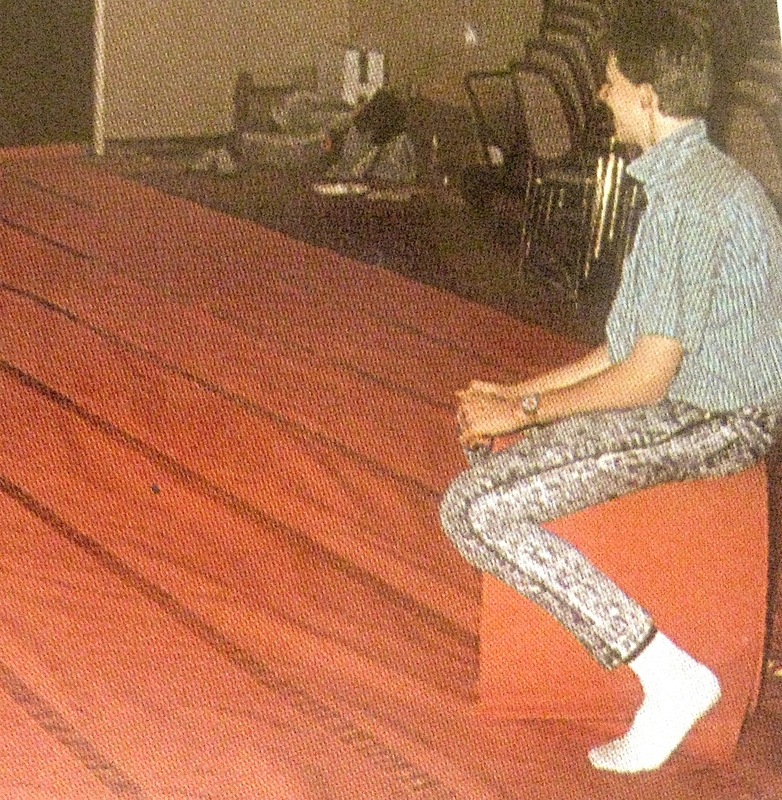 Allan Jeans & KB, struggling through ‘that’ banner! 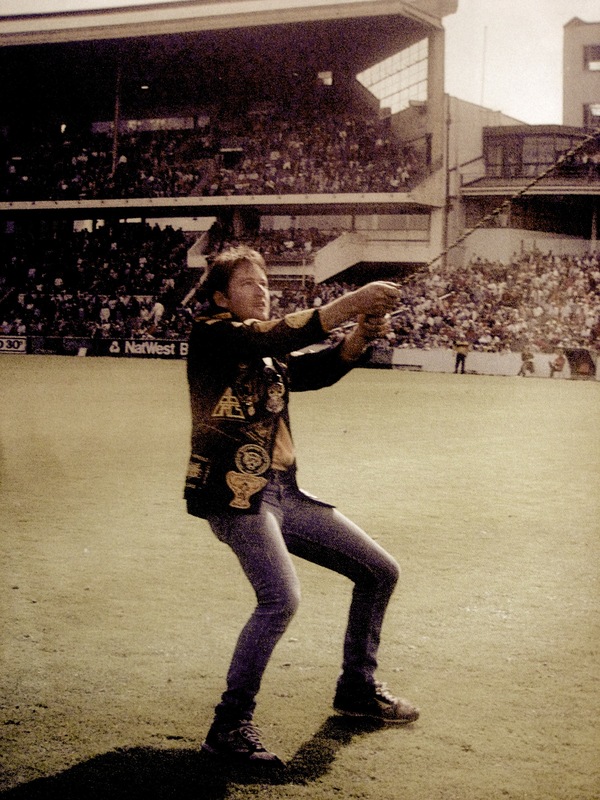 This entry was posted in Boot's Library and tagged afl, Banner, book, Cheersquad, Footy, Runthrough by theholyboot. Bookmark the permalink. Fantastic post John. 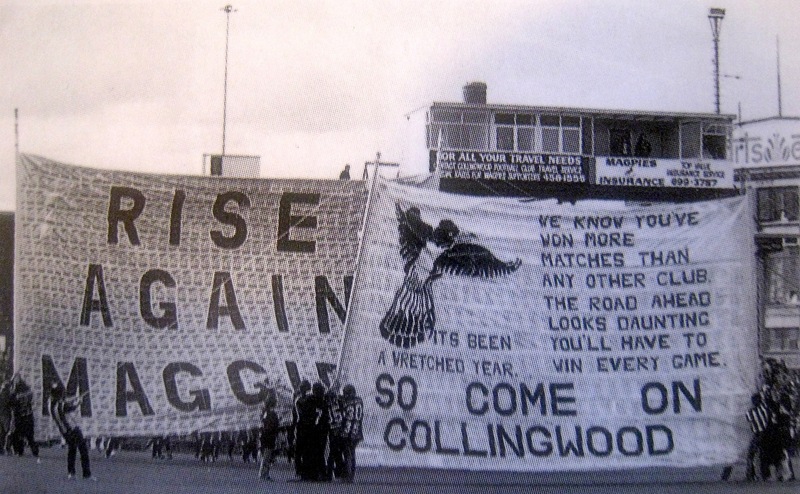 Love the old no-holes-barred banners before size restrictions and club approvals (eg ‘Moore Filth’ when Peter Moore played against Coll for the first time). I remember when I was 4-6 yrs, before I started going regularly, the 2 questions I’d always ask my older brothers as soon as they got home from the game were ‘did we win the little league and what was on the banner?’. The only things I couldn’t glean from the Captain & the Major on the wireless.